16th March 2014 – Double Olympic and World Champion Mo Farah (GBR) recovered from a heavy mid race fall to get second in the New York half marathon. The British hero was running in the middle of a pack of 8 runners when he accidentally tripped and landed heavily on the tarmac. He got up and gave chase eventually getting back up to 2nd place behind race winner Geoffry Mutai (KEN). 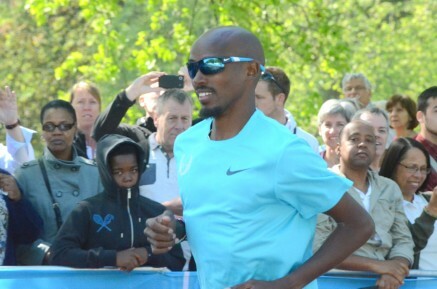 Farah clocked 61:08 in cold conditions. He momentarily passed out at the finish line but was fine to talk to reporters after the race. His next race will the London marathon in April. Another athlete targeting the London marathon Chris Thompson (GBR) showed good speed with a 22:35 clocking at the South of England Road Relays in Milton Kenyes.